The silver fox jacket is a must-have of this millennium for all the classy women. Very requested and used especially by celebrities, on the catwalks and during formal affairs. The silver fox jacket has been used less during the past years, because of the high price of a good quality jacket and because of the lack use in the fashion industry. There are other kinds of fox furs besides the silver fox fur, more employed in the fashion industry because of their cheaper price and because they are easier to dye. Very used is the Blue Fox because has a shorter nap than the others so it doesn’t make you feel fatter when you wear it, and above all because it’s almost totally white so this makes it perfect for those who prefer dyed fox furs. The fox furs are not all the same, the difference is indeed explained in plenty factors, and in this page we will explain how much is a silver fox fur and its variants such as coats and vests, models produced by Elpidio Loffredo and its different kinds of leathers. How much is a silver fox fur jacket? Which silver fox fur should I choose? Elpidio Loffredo uses an extremely sublime quality of leather to make his silver fox fur jackets. Our leather comes from the auction hose Saga furs and accurately chosen by our staff. Usually inside Elpidio Loffredo fox collection you can also find, besides Finnish SAGA FURS leathers, others coming from North America NAFA. Along with many other types and mutations used inside Elpidio Loffredo collection, such as shadow blue frost fox fur or the blue frosts. Another decisive factor is the manufacturing. Every year our artisans improve their techniques for chasing perfection, since the fox fur are very heavy. This trend changes in Elpidio Loffredo’s world, since the accurate research made every year, the fox fur outwears are very lightweight! The provenience of the leathers and of the ended item of clothing determinates its final price, because a lower quality or a lower labour supports a low price. 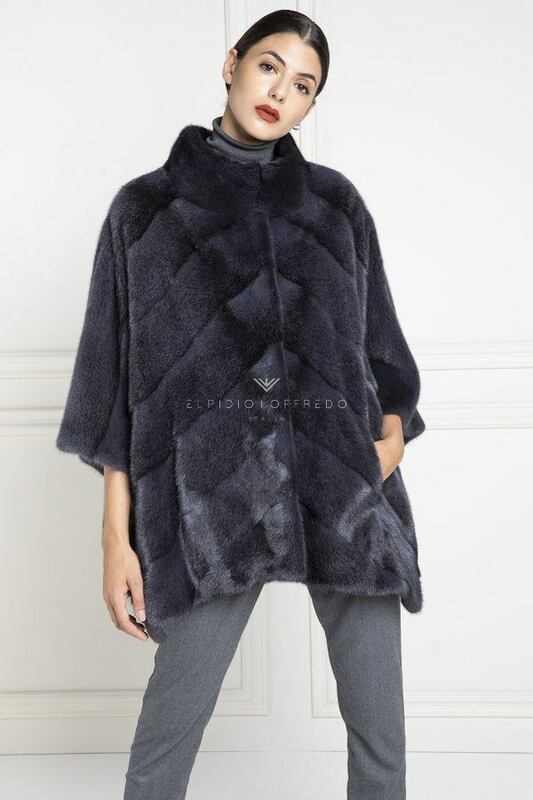 Elpidio Loffredo fox furs are completely Made in Italy: every ElpidioLoffredo item is accurately created by Italian artisans. A quality and dependability choice, representing the real point of strength of the company, and the main characteristic of his creations. The silver fox fur jacket by Elpidio Loffredo has been created by using only the best kind of leather in auction, since you can acquire this type of leather also in a low quality but it changes in colour and has not the same shininess. 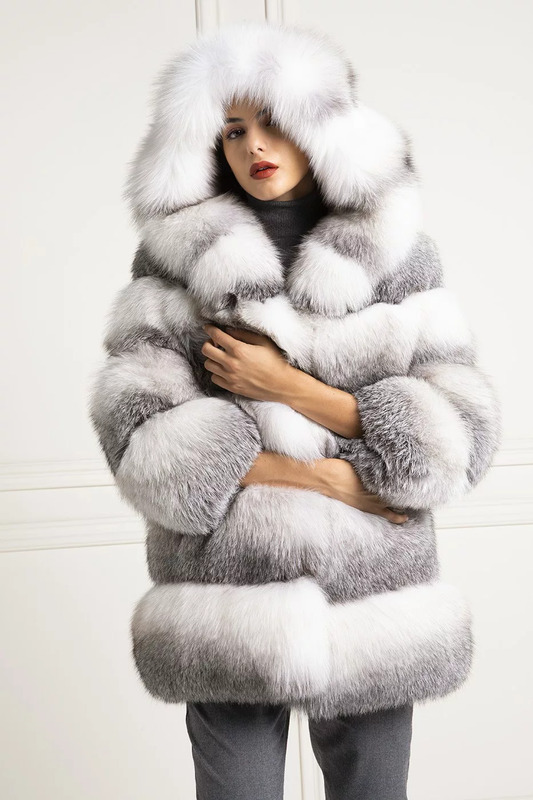 Every fur, even if is not similar apparently to the others, has peculiar particularities that makes an item of clothing unique. It is necessary, for example, to consider that for the final price of a fox fur, compete different aspects, such as the design, the manufacturing, the finishing, the colouring, and no doubts, the quality. Obviously choosing a made in Italy brand that gives you, in the moment you buy it a quality certificate, is an additional guarantee to buy a fox fur that maintains his value intact. Many people don’t know that exists a kind of leather very similar to the silver fox and it is called blue frost. Some companies sell blue frost foxes as silver foxes so they can increase their earning on the sale. Silver fox has a very long nap with shades starting from white until black at the extremity. Choosing the kind of silver fox to wear is important. In the 70s the silver fox coat was in vogue, very long and with a largeness superior than 4 meters. During passing years, style changed and there was a major request for silver fox shorter coats. Today everything has changed. Our clients require mostly silver fox fur jacket and silver fox fur vest. 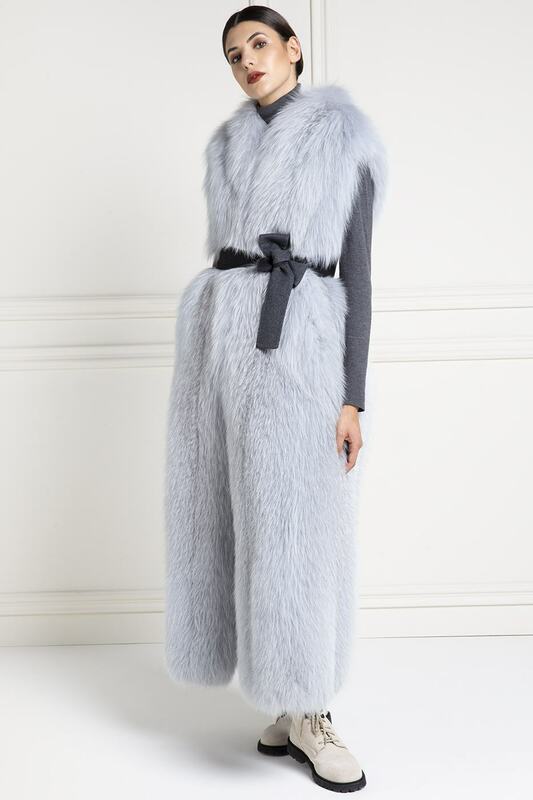 The hooded silver fox fur jacket is for sure something you can always wear. Elegant but at same time sporty! Elpidio Loffredo offers, in his collection, different models of fox fur jackets and fox fur coats. Clients also require fox fur caps, and Elpidio Loffredo tailor-mades for the most demanding clients. Elpidio Loffredo collection tries to satisfy each client starting from the models until the leathers. The chosen leathers by Elpidio Loffredo have an excellent quality. Indeed, during the auction, Elpidio Loffredo buys also the Top Lot. Elpidio Loffredo’s collection is full of natural foxes and dyed ones. Elpidio Loffredo offers a great choice of his leathers to his clients. That is just because lot of people love fox fur but they don’t always prefer a long nap such as some mutations or silver fox. There are natural colours, and many others dyed especially on Blue foxes or when a client asks for black shades on the fur, they dye shadow foxes or artic marble foxes. If you want to buy a dyed fox fur, try to rub the fur with a humid rag: if it doesn’t change colour than it is an high quality item of clothing. About the choice of the colour, it is very important to acquire a colour that you can use in your daily outfits. Often you choose the colour also depending on the current trends. Elpidio Loffredo collection works toward on natural colours always required and appreciated, because almost no brands produce.